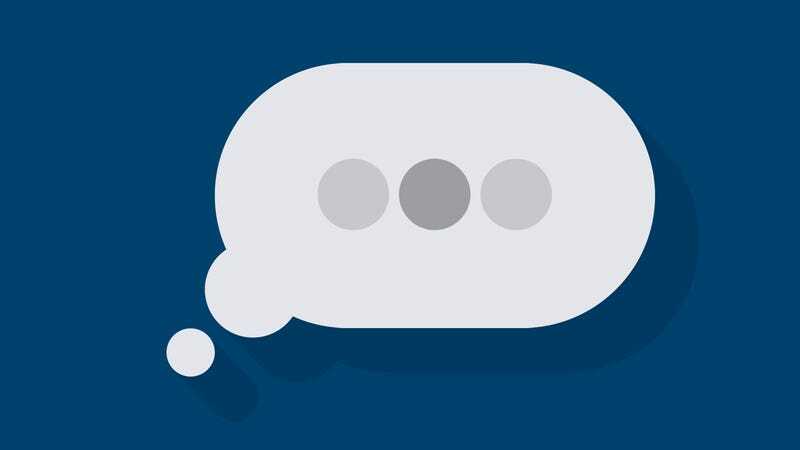 Whether it’s a series of blinking ellipsis or an explicit notification that “someone’s typing,” the messaging feature known as a typing indicator is both a useful tool and a source of anxiety for many people. But knowing more about how it works can at least limit the guessing games that cause us stress. “Hi,” your boss types in the Slack DM, and then appears to type for 10 minutes. What the hell are they typing? What’s happening? Did they just type a sentence and walk away and this damned thing is continuously reassuring you that you’re definitely getting fired? Maybe. Or, your significant other types, “we need to talk,” and the typing indicator keeps popping up and disappearing. Are they adding on to a thought? Are they constantly erasing what they just said, so they can say, “I’m just not into you” with the cleanest execution possible? Probably. Like many people who work in an office these days, my interactions with co-workers are almost entirely relegated to Slack, a popular team messaging app. Outside of work, I use different messaging apps to keep up with friends and loved ones, and I’m allergic to phone calls. Someone is always typing. And like most people, I don’t think much about it unless it’s one of those potentially consequential incidents, at which point I turn into a neurotic basket case. The first thing I wanted to know was whether Microsoft held a patent on type indicators that everyone else pays to license. Auerbach said that he’s sure there’s some patent out there, but he doubts any other companies are licensing it. “The way tech companies work is that everything gets patented, but it’s rarely enforced—it’s more of a mutually assured destruction mechanism,” he explains. The idea being that if Microsoft went to Facebook demanding it pay up for one patent, Facebook would just counter with one of its own patents that Microsoft is violating. 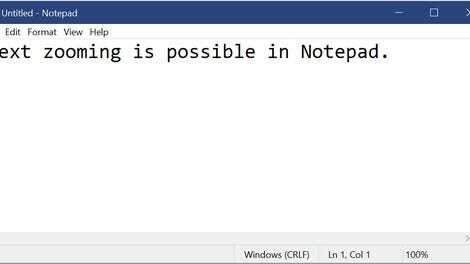 Just last year, Microsoft patented a new “enhanced” typing indicator with some minor cosmetic changes. And there are all sorts of tiny, little patents related to keyboard inputs that would probably grind the tech world to a halt if they were rigorously enforced. When Microsoft’s engineers first elected to add a typing indicator to Microsoft Messenger Service, it was at a time when the protocols of adapting real-world communication were still up in the air and emojis were still years away. But the notification served a more practical purpose than just humanizing communication: It let you know that the person you were speaking to was still on the line. “Back when it was a dial-up connection, someone could appear online that was actually disconnected because the disconnect wouldn’t register for a while,” Auerbach told me. This keep-alive mechanism just gave users another signal that they can rest easy that they weren’t speaking into the void. It was more a source of comfort than nervous anticipation. Of course, the world in which we live today brings an assumption that everyone is connected all the time. We may shrug and give it a pass when someone says, “hey, sorry I just got this,” two days after we sent them a text, but we know they saw it far earlier. Still, more people using chat online means there’s a greater need for a traffic cop, and that’s where typing indicator’s serve their most valuable function today. When 1o people are in a group chat or 100 coworkers are communicating in a single Slack channel, the indicator lets us know that we might want to reconsider interrupting others. In the case of Microsoft’s early implementation of the feature, Auerbach’s memory is a little fuzzy on how it exactly worked, but he believes the notification that someone was typing would be triggered on the first keystroke and repeat as more keystrokes occurred. If no keystrokes were registered after five or 10 seconds, the indicator would no longer be displayed on the other end. As far as he can remember, that was the only function—a user was either typing or not typing—and the addition of “Jane has entered text” came later. For the most part, notifying users that someone has “entered text”—meaning, they wrote something but might not be actively typing—isn’t as widely used today as it was in the mid-aughts. Which also leads to the question of whether a service is simply saying someone’s typing when they merely entered text and stopped. We can’t say definitively that no service uses such an idiotic system today, but it’s highly unlikely. Not only would that be annoying, but back in Auerbach’s days at Microsoft, the team estimated that 95 percent of the messages flowing through the servers were just that constant repetition that someone was typing. Only 5 percent of the messages were actually the finalized communication being sent to a user. If a user stops typing for 5 seconds, Slack removes the indicator that they are typing. “Several people are typing” (three or more users) - fun fact on this, Slack’s blog is named after this indicator. It’s also worth noting that you can turn typing indicators off in Slack. As for other platforms, they seem to work in much the same way. Facebook wasn’t quite as detailed in their response but Messenger’s typing indicator is pretty simple Hany Barakat, Engineering Manager at Messenger, told us. You will only see the typing indicator when a person is actively typing, so it won’t show up if someone has simply entered the text box and might not actively be engaging with the conversation. It will no longer appear once the person stops typing. Our tests showed that the typing indicator shows up immediately in Messenger as soon as a single character is entered, even if that character is a space, and the indicator disappears 5-1o seconds later if no more characters are entered. Apple didn’t respond to our request for info, but our own informal test showed that iMessage’s typing indicator appears as soon as a single character is typed, and spaces without any characters activate it. It takes five seconds to disappear if you clear the text field and 60 seconds to go away if you simply stop typing. It also pops up if you load a picture without sending. Auerbach doesn’t particularly have regrets about the typing indicator but understands that it’s come to have a different place in our stressful multi-tasking lives. He does believe that every service should make it an option that can be shut off, and it definitely shouldn’t be included on every messaging platform. “That’s one thing I can think of that would make Twitter even worse,” he deadpans. For the love of god, Twitter, don’t get any ideas. Google vs Apple vs Microsoft: Which Online Office Suite Should You Be Using?